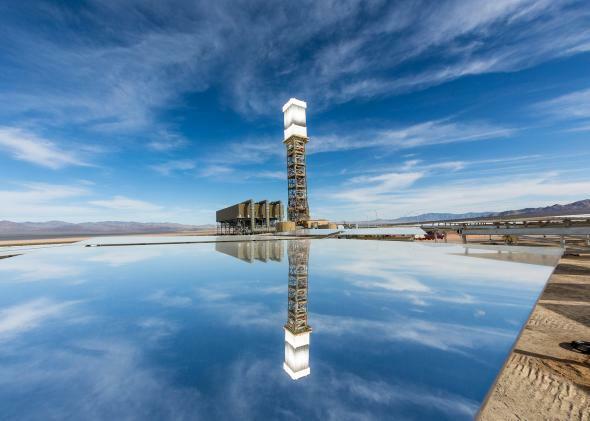 Ivanpah opening: Is solar thermal the future of US energy, or a dead end? World’s Largest Solar Plant Opens in California. Is It the Future, or a Dead End? The Ivanpah solar power plant uses tens of thousands of mirrors to concentrate the sun’s energy on a trio of towers taller than the Statue of Liberty. Sprawling across 3,500 acres of the Mojave Desert is a system of gleaming mirrors and soaring towers that looks like nothing else you’ve seen. It is, in fact, the largest solar thermal power plant in the world, and it officially began operating today. At full capacity, its 173,500 heliostats and trio of 459-foot-tall towers will pump out 392 megawatts of energy, or enough to power some 140,000 California homes. It’s tempting to view this as the beginning of a new era in the American energy industry. Solar power has been booming in recent years, and Ivanpah is in some ways the U.S. solar industry’s new crown jewel. California utilities have agreed to buy power from the new plant to comply with a state law requiring them to get a third of their energy from renewable sources by 2020. Yet amid the celebrations, clouds have gathered over the future of the technology that the stunning new project employs. Where conventional solar power plants rely on photovoltaic panels, solar thermal plants use a different process. The hundreds of thousands of mirrors concentrate the sun’s energy on the central towers, where they turn water into super-hot steam. The steam then propels a turbine, which generates electricity in the same way as more conventional power plants. An aerial view of Ivanpah. BrightSource, the Oakland-based startup that developed the technology, believes this is a promising way to produce solar power on a huge scale, as opposed to on one’s roof. In theory, it could allow for energy storage systems that can churn out electricity even when the sun isn’t shining. Another recently completed solar power plant, in Arizona, does in fact store energy using molten salt. But Ivanpah doesn’t do that, for now anyway. And yet it’s quite expensive—probably more so at this point than power from conventional solar panels, whose prices have dropped steeply in recent years. It feels a little lopsided to knock Ivanpah for killing a few birds without mentioning the devastating toll that fossil fuels have taken on the world’s environment. And the project’s backers are confident they can find a way to minimize the harm. Still, it’s a legitimate concern. A bigger problem might stem not from any of the project’s failings, but from its success. The San Francisco Chronicle reports that, between Ivanpah and several other solar plants either under construction or recently opened, California is well on its way to meeting its renewable energy goals. That’s a good thing, no doubt, but it also means that the nation’s only big market for solar thermal plants is drying up. BrightSource and other utility-scale solar companies may be forced to look abroad for new business, or hope that other states pass similar laws. 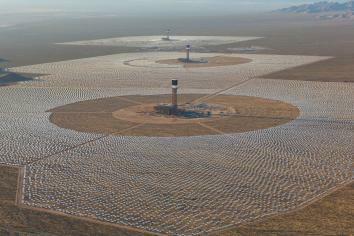 Ivanpah is solar thermal’s first big hurrah in the United States. Its backers hope it won’t be the last. *Correction, Thursday, Feb. 13: This post’s headline originally misstated that the power plant was in Nevada. It’s in California, near the Nevada border.